A pet lover would love his front door glass featuring his most loved pet may be a dog or bird, or a psychologist would try to create a brain in his clinic window glass, an architect would appreciate beautiful buildings on his glass door in the office. Choices vary but Impala Glass Industries can make everything possible, dreams and choices can be designed on glass as per customer's preferences. It is a premiere destination for all the Vanceva Laminated Glass, Sandblasting Designs on Glass and much more. 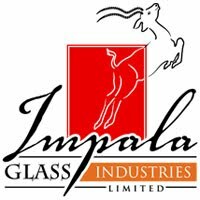 Situated in East Africa, Impala Glass Industries Limited is a glass manufacturing company which provides complete solutions for all glass needs. The experts are there to complete etching and sandblasting designs on glass resulting in a number of artistic pieces each with a unique effect. Sandblasting Designs on Glass is created for perfectionists who want it the best. The results are sharp, appealing, pleasing and perfect bringing a noticeable change on the glass. 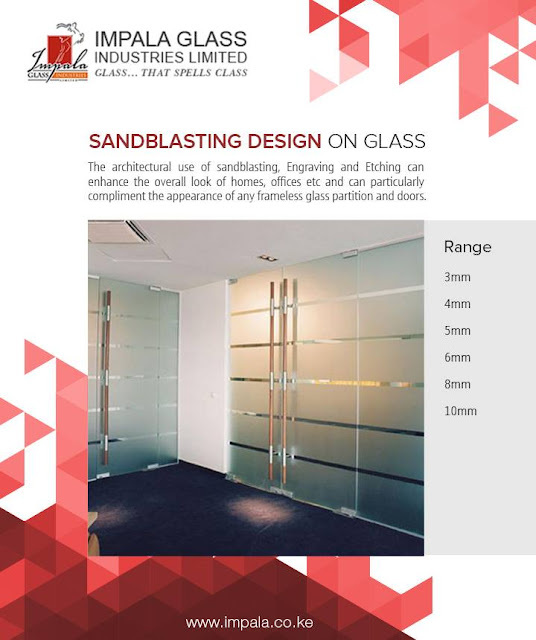 Sandblasting Designs on Glass can be made in many places like dividers, doors, windows, shower rooms, enclosures, glass walls etc. The elegant and beautiful look along with milky white seems is mesmerizing and pleasing to eyes. They change the whole outlook of the place adding grace and style. A huge variety of designs along with many different glass types to suit individual needs is available at Impala Glass Industries. Even a small design sandblasted on glass can transform the place. Every individual is unique and has his own choice and preferences. A sandblasted design of computers, laptops or other technology may suit an IT office or a lovely holiday resort design on glass would go well with any travel agency. Sandblasting Designs on Glass is a creative way to impress your clients and advertising your work. Even a housewife would like Sandblasting Designs on her kitchen window glass of vegetables and fruits. It's all about how the passion and interest inspire the glass decor. Today many coffee shops and local cafes have incorporated famous quotes and sayings on food, love, and coffee on their glass walls and mirrors. Most of them are too cheeky to read but fun. Even a few bakeries have Sandblasting Designs of cookies, cakes, and biscuits on their glass doors just to capture attention and stop customers to read it and then enter in. Even kids playgroups and Montessori's have designs of Disney and Marvel characters along with nursery rhymes to create a feel of imaginations coming to reality. Like Spider man swinging on the walls, or snow white sitting with her 7 dwarfs or simply a beautiful garden design with lots of butterflies and flowers. It would be splendid and results would astonish you. There are numerous ideas, visit Impala Glass Industries to know more!